Books and Needlepoint: Chasing the Red Car by Ellen Ruderman - Giveaway! 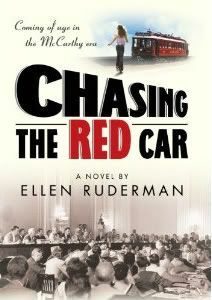 Chasing the Red Car by Ellen Ruderman - Giveaway! Transplanted from her home in the Bronx to the burgeoning San Fernando valley of 1947, Kim Lebow is faced with trouble on every side. Her home life is rocky and emotionally unpredictable, while the McCarthy era communist witch hunts strike all around, threatening Kim's father and even reaching into her high school. The political struggles and personal cataclysms that follow change Kim from an open and caring young girl into a political activist and educator, while leaving emotional scars that only time, and the return of the great love of her life, are able to heal. Drawing parallels between the political repression of the 1950s and the abuses of executive power after 9/11, Chasing the Red Car reminds us that all politics is personal, and that the truth of George Santayana's maxim about history repeating itself can be seen all around us every day. Thanks to Julia Drake PR and the author, I have one copy of this book to giveaway. To enter, please fill out the entry form - links will be checked, so please be sure to leave them. Winner of Chasing the Red Car! Summer in the South by Cathy Holton - Giveaway!